Walmart, the multinational corporation and world’s largest company, has awarded a grant to Rainbow Rabbit Educational Services Corp. to expand their anti bullying/kindness program and help further implement their efforts across the Tri-State area and beyond. Birches Elementary School Kicks off Kindness Week 2018 in Style! Birches Elementary School in Turnersville, New Jersey rolled out the red carpet for Kindness Week 2018. 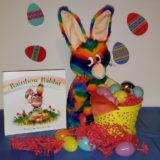 Much to his delight, Rainbow Rabbit was invited back to be part of the festivities! Unity Day 2017: Stand United! Unity Day 2017 takes place on Wednesday, October 25. Whether you are part of a school community or members of social media groups online, many send messages of support and hope on this day and wear the color orange, to show they stand united against bullying, and support messages of tolerance, unity, acceptance and inclusion. Team Rainbow Rabbit is always on the lookout for inspiring stories in regards to the bullying epidemic. The following article focuses on 13-year-old hip-hop sensation Frankie V, who is using his music to try and help bullying. You can read the story below from abc10 in Arizona. Sometimes, those being bullied take matters into their own hands. However, it’s an oddity to see the bullying victim being shot by an officer at his school. Rainbow Rabbit welcomes you to his brand new website! On behalf of all of us at Rainbow Rabbit, I would like to officially welcome you to our brand new website!